What do you expect from Trent Murphy in 2019? I was dissapointed that he didn't play better or hit doubl digit sacks, but historically, many guys ned more than 1 year to recover both physically and psychologically from such a serious injury. Besides, he wasn't that bad -- just average, really. He's still relatively young too. I just hope he stays healthy. Seems hampered by injury all year. Will they keep both him and Shaq (assuming Hughes stays too) plus draft a pass rusher high? I expect him to play 40% of the defensive snaps when he's healthy enough to do so. I'd say the over under on games missed this year due to injury is 5. Other than that I dont expect much. He's had 4 seasons in the league, with his high point being 9 sacks with Washington, other than that he's had 2.5, 3.5 & 4 with the Bills last season. So like i said, i don't expect much outta him for the Bills. For Trent i expect he'll cash in another 8.5 mil & live a pretty comfortable life that the most of us can only dream about haha. Its really going to depend on whether he can stay healthy or not. Sad but true. Can't expect him to do an Aaron Schobel type comeback like in 09. I agree we'll be lucky to get 40% snaps out of him in some rotation with Shaq and Lorax. Hughes is one of the most explosive guys off the snap Lawson/Murphy had to have been two of the slowest. Get healthy and play better or get cut and make room for someone else! To miss at least 4 games. I’m pretty good with all their defensive moves but this is one of my least favorite. I wish I expected more than injury. Please prove me wrong!!! I think if he makes it through training camp and pre season relatively injury free we could actually see a pretty solid year from him. If we start seeing something nagging him constantly......he could be cut or even a trade attempt of some kind. Bills need an upgrade opposite Hughes. Lucky the draft has quite a few. Man, everyone loved the Murphy signing before the season. Now everyone acts like they hated theove and Beane should be fired for it. I think he can be an effective pass rusher when healthy. Let's hope he can get healthy and prove everyone right (sentiment from when we first signed him) and everyone wrong (current sentiment). I expect Trent to be playing for another team next season. I liked it. I was expecting some pressure out of him. Our sack #'s were pretty bad with him being hurt and Hughes being held so much. If he can stay healthy, our sack #'s should be better. Imagine this defense with more pressure! I expect him to be cut. This. 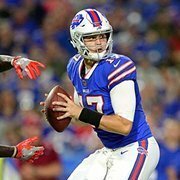 The Bills structured Murphy's contract with an out for this offseason. Cutting him before the 5th day of the league year will leave the Bills with a $3.5M cap hit, freeing up $5M to be put toward someone who can make more of a contribution. He was pretty effective when healthy. I'm just concerned about his availability. He's a solid pass rusher when he's able to suit up. Was not impressed at all with him last year. Injury or not he was still out there. I expect Trent Murphy to be cut. Injury concern, and he's nothing special when he is on the field. Actually, a run defense liability as he doesn't maintain his lane. I expect you will be disappointed. So,you expect him to play day in and day out next summer at SJF, how else can you pass judgement if he doesn't ? He's damaged goods and has no push from his lower body...up top he's strong and has a wide wing but that does n'tcut in the NFL since these OT's are getting taller,bigger and stronger..with tree trunks for legs. Me too. And I think he will be.